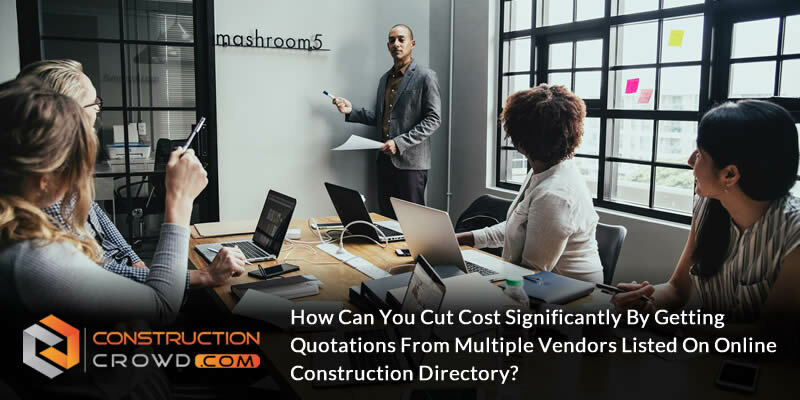 How Can You Cut Cost Significantly by Getting Quotations From Multiple Vendors Listed on Online Construction Directory? Both, the cost and your time can be saved significantly by getting quotations from multiple vendors listed on online construction resources directories such as “Construction Crowd”. Getting multiple quotes can help you decide what is best for you by comparing them with one another. You can choose the best vendor for your requirements easily by getting different quotes from vendors listed on construction industry online directories. kindly check below points that prove this statement. In order to cut the costs that come with your construction project, getting quoted from different vendors is quite helpful. By getting quotes from more than one vendor, you will be able to compare them according to their costs, the services they provide and their experienced which will help you in choosing the best one for you based on your project needs as well as financial condition. In case you have end up short-listing a few contractors for your project needs from a popular construction directory then this is the point from where the actual work begins because you need to choose the best one among all. To choose the best, a detailed research is essential on the services that the vendor provides along with all the little business detail of the vendors. You need to make sure that you have received all the information about the business related to their services, their reputation and their previous works. Also, while researching on a vendor through the online construction directory for contractors you must also check the reviews of their previous customers as they tell a lot about the vendor. These reviews can make the decision of choosing the best vendor, quite easy. And when you choose the right contractor then you just need to sit down and relax while they are managing your project. This is quite effective in terms of saving time as well as money. Getting quotes from different vendors that are listed on online directories can also help you in cutting the project cost by vendor-customer interaction. The communication between both the client and vendor is important before getting the things finalized and the interaction is quite easy through these directories. So, when you get quotes from different vendors then don’t forget to ask all the questions that are going in your mind as it will end up clearing all the confusions you might have and it will also help you in choosing the right vendor according to your budget. Checking out and going through construction industry online directories also helps a lot in connecting with the right group of vendors which results in hiring the right vendor as soon as you want. These directories can help the people in finding the professional as well as experienced vendors for their home planning in the simplest way that too by staying within your budget. To get quoted from different vendors and to cut the cost significantly, you can check out “Construction crowd” (www.constructioncrowd.com) which is one of the best online directories for construction vendors.